Afrin (Syria) (AFP) – As soon as Turkish warplanes began bombing raids over Afrin on Saturday, terrified residents of the Syrian Kurdish enclave dashed to take cover in the cellars of their homes. “My four-year-old son is terrified every time he hears the sound of an airplane,” said Nisrin, a housewife in Afrin who asked that her real name not be used. 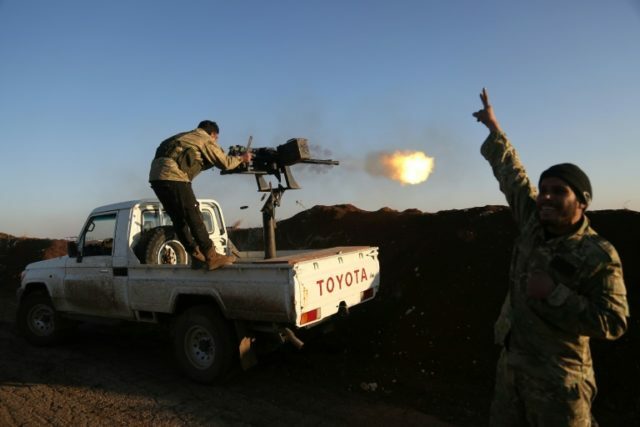 Turkey and allied Syrian rebels on Saturday began an air and ground operation, dubbed operation “Olive Branch”, aimed at ousting the YPG from Kurdish-majority Afrin. Ankara vehemently opposes the YPG, accusing it of being the Syrian offshoot of the Kurdistan Workers’ Party (PKK) which has waged a rebellion in southeast Turkey for more than three decades. “The biggest fear we have is that international forces on the ground in Syria which claim they’re here to fight terrorism and find a solution to the Syrian problem will turn a blind eye,” Mustafa said. Several world powers have deployed forces in northern Syria, among them regime ally Russia. There are also troops from the US-led coalition fighting jihadists. “The only option the autonomous administration has is resistance. Nothing else. We will not allow a Turkish occupation of Syrian territory,” Mustafa said on Saturday. A YPG statement echoed this stance, saying the Kurdish fighters had “no choice” but to fight back against Turkey’s “barbaric aggression”. Jamil, a 22-year-old communications engineer in Afrin, said he could not believe Turkey had dubbed its assault operation “Olive Branch”.